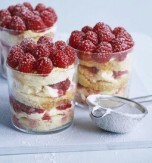 This scrumptious dessert will become a perfect sweet gift for women and girls on the 8th of March. They will appreciate the efforts because a homemade treat made with love is better than anything you can buy in the store. This dessert is highly addictive and very hard to resist. 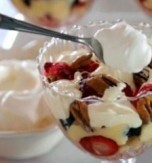 Wonderful creamy base topped with indulgent strawberries which just look gorgeous in dessert bowls. Be prepared that this dessert can be eaten in minutes and your soulmate will ask you to cook the second portion. Put white chocolate in a freezer for 10-15 minutes and then grate it. Pour water in a bowl and dissolve gelatin there. 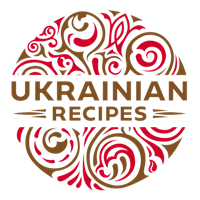 Combine sugar, vanillin, liqueur, and yolks. Whip the mass with the help of a mixer. Combine the gelatin with 3 tbsp of the prepared hard sauce. Then add the remaining hard sauce and put the mass in a fridge for half an hour. Whip the cream until fluffy. Stir the hard sauce carefully. Add the grated chocolate and whipped cream. Mix the ingredients. 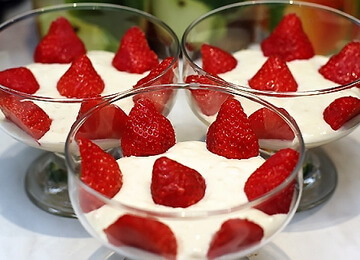 Put the prepared mass in serving bowls, cover them with parchment paper and place in a refrigerator for a couple of hours (it is better to put the dessert in a fridge for the whole night before serving). 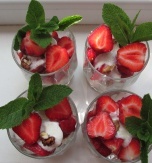 Wash strawberries and cut them into 4 halves. 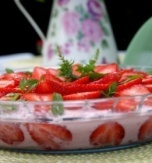 Decorate the dessert with the strawberries and serve.